The school sought to revamp its 16-page alumni newsletter into a more engaging publication that would resonate with alumni, showcase the global work of the students and the school, and serve as an impressive marketing tool. 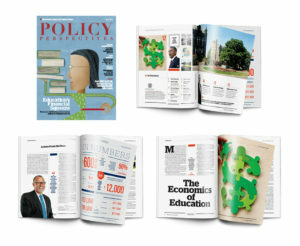 WCM’s editors and designers created a fully redesigned, print and digital magazine for the McCourt School of Public Policy that featured interactive social-media components. The editorial content focused on public-policy issues and the global efforts of faculty and students. The turnkey product helped the school accomplish its communications goals while maintaining a strong dialogue with its audience.